Spiritual Stepping-Stones . . . . While thinking about spiritual stepping-stones earlier in the week, I remembered some very special stepping-stones off the coast of Cornwall, England. 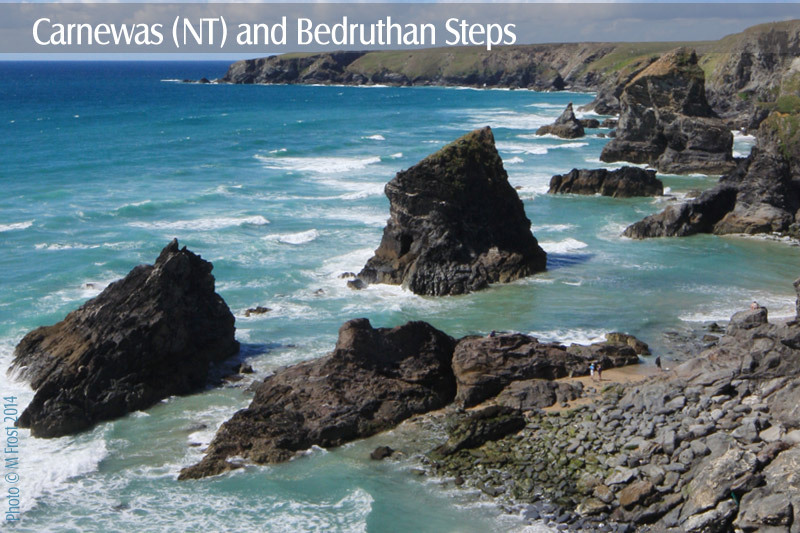 Named after a legendary giant named Bedruthan, we took our children to see the rocky formations the giant supposedly used as stepping-stones to cross the bay. The view was spectacular as we stood on a cliff several hundred feet above the Bedruthan Steps–imagining the giant crossing the bay toward us against the setting sun. The process must begin and end with prayer to be truly effective. (It is God who has established “the race marked out for us,” so it is entirely reasonable to look to Him for the practical insight we need.) Ask Him to help you identify: a) meaningful events that have impacted you; b) the Scripture Marker you remember it by and, c) the Spiritual Stepping-Stone that helped you to move forward. The first spiritual stepping stone marks when we embrace Christ as Lord and Savior of our lives. Asked God to take over my life; to save me from myself. Spiritual Stepping-Stone: Jesus became my resting place as well as my primary source of strength each and every day. When overwhelmed by the possibility of losing our third born, God quieted my heart with the assurance that His purpose (no matter what happened) was for our family’s good. Spiritual Stepping Stone: I found great comfort in God’s goal for me: “to be mature and complete, not lacking anything.” I embraced His goal as my own. Spiritual Stepping-Stone: I slept peacefully that night despite the grief experienced that awful day. Since that time, I have learned to major on loving others, while leaning on the Lord to face- off evil in the world. When frightened because of personal health concerns I found myself gripped by fear as I contemplated my future. Spiritual Stepping-Stone: God’s answer calmed my fears as I learned to stop running and intentionally trust Him more. I could go on, but I think you get the idea. I was surprised by how the process came together once I got started. If a Scripture Marker does not come to you right away, ask God to help you identify one that is meaningful to you. (You need the Scripture Marker to provide your Spiritual Stepping-Stone to stand on.) Whether you are facing a difficult situation, have an important decision to make or are at a relatively quiet place in your life, I encourage you to take time to do this for yourself. Being able to view the Spiritual- Stepping-Stones of your life cannot help but strengthen you to finish the race God has marked out for you! ‹ PreviousSimple Questions . . . .
You are very welcome Megan–thanks for being such a sweet encouragement! Thank you so much!! Reading this made me think that I need to sit down and right out my Spiritual Stepping Stones and right the verses that gave me strength to get thru the journey. You will be blessed when you do Missy–all to His Glory! This is a wonderful idea! I feel like I would need some time to sit and reflect and look through my Bible and journals, remembering but I want to do this some day…. Much thanks for the thought. This is a wonderful idea Kathie. Not only will it increase our faith to look back at the stepping stones God has used to grow and mature us, it could be a legacy that we pass down to our family for future generations to come. This reminds me of what the Israelites did in Joshua chapter 4 when they set up 12 stones at the place where God caused the flow of the Jordan river to stop so the ark of the covenant could cross over. God told them to set the stones up to serve as a memorial to remember what He had done there. Future generations would see these stones and be able to hear about God’s miraculous intervention for His people. Your idea here is similar in the way that we can set up our own memorials of God’s faithfulness. We can’t go around and literally set up rocks in places where God has worked in our lives 🙂 but instead we can write these things down for future generations. Thanks Chris, I just finished a study on Joshua so I totally get what you are suggesting. (I had to giggle when I thought about carrying around those twelve stones to set up!) What is really a joy for me, is that I originally started blogging was to pass on lessons I have learned for my kids. To encourage others like you makes it so much sweeter! Rejoicing in Him always!